Are you looking to pimp your car with an affordable yet high-quality subwoofer with an aim to enhance the quality of its default sound system? Well, Autopticals is definitely the right place to end that search. As usual, we are here to provide you with unbiased reviews of only the best auto parts that offer you real value for your hard-earned money. For our post today, we take a look at some of the best 8 inch subwoofer options which we believe will significantly make your trips more fun and relaxing once installed in your car. As you know, car subwoofers cover the lower end range of frequencies which smaller speakers cannot reproduce. With it, you can enjoy an added level of power and sound to your audio system which results in a well-rounded car stereo. If you’re driving a hatchback (or any other car that’s short of space to accommodate a large subwoofer), then going for a smaller sub such as an 8” will certainly be a great idea. And while these types of subs obviously won’t be heard miles away, they still add a relatively decent thumping bass to your car which is what matters to you, right? Besides, these audios have reduced mounting depth and size thereby making them ideal acquisitions for you in such a case. So, how do we assist you choose the best 8 inch subwoofer that suits your needs? Well, we understand that there are numerous brands of 8-inch car subwoofers today with most featuring nearly similar functions and confusing descriptions. Of course, this can be a little overwhelming to you as you try to choose the right one without compromising on the quality of the sound. 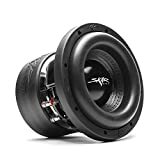 It is the reason that our team spent some time researching and testing a few of these devices before we compiled a list of the top 10 best 8 inch subwoofers as you will see below. Besides, we’ve also provided you with a detailed guide on how to choose a good car music system which we hope will make your decision-making even much easier. If you’re looking for a perfect solution to a lack of bass in your car audio system, search no more. Bazooka BT8024DVC Bass Tube features a solid 8 inch car subwoofer with a twin layer compressed foam surround for a smooth excursion. The tube design ensures that there’s no standing bass wave for accurate response and also high efficiency. This 8 inch subwoofer also features corner-loading optimization which offers maximum bass performance. Besides, it features 400 watts maximum power handling with an amazing dual 4-ohm impedance. Bazooka BT8024DVC package includes straps for secure mounting while also making it super easy for you to detach it any time you need to. This means that if you like changing cars (or want to use one audio system on several cars), then this could be your perfect fit. It also has an optional chrome plated UMS brackets that give it a conspicuous classy look although this is more suitable for use if you want to permanently mount it on your car. Perhaps what you’ll love the most about Bazooka BT8024DVC are the tube enclosures that help create a uniform natural hydraulic transfer of the bass energy produced by the sub. While it has a deep bass, it lacks the rumble. The SBP8A comes ready to add some dynamic thump to your otherwise boring ride. The rugged 8 inch subwoofer enclosure houses a powerful subwoofer that offers adequate firepower which is made possible by its polypropene cone and stamped steel basket. The built-in amplifier powers the sub with 80 watts RMS for a surefire response. Better yet, you can use the variable low pass filter and phase control to fine tune the bass. The impressively looking bandpass enclosure has 5/8 inch fiberboard construction that offers strength thanks to its medium density. Its standout feature, however, is the clear acrylic window that lets you see the action inside the woofer. The chamber has 4 LED lights that offer visual enhancement and which matches incredibly well with the bass. You will also love the durable black carpet cover that help to protect the subwoofer as well as your vehicle from scrapes. SBP8A is easy to install. Great looking enclosure and 4 LED lights. We didn’t find any, oddly. When space is tight and the amplifier is moderate, consider choosing the Jl Audio 8W1V3-4 W1V3. 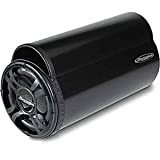 This car subwoofer comes with a shallow mounting depth (3.86”/98mm) and a compact structure to fit in so many spaces where a typical 8” driver won’t. It also doesn’t feature a pole vent so that you can place it against an enclosure boundary if need be. This 8 inch subwoofer works best with an amplifier with a power range 50w-150W. Jl Audio 8W1V3-4 W1V3’s elevated frame cooling design which cools air via slot helps to enhance sound quality and power handling. 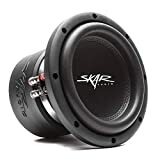 Besides, considering that this car subwoofer has been assembled using the unique floating cone attach method, you can be sure of enjoying a proper surround geometry in the sub’s speaker for better dynamic voice coil alignment and excursion control. The sub also comes with a customizable trim ring which can be painted to match the installation theme and can also be inserted with JL Audio Grille mesh. Jl Audio 8W1V3-4 W1V3 also features a Lead Wire System design that ensures quiet lead-wire behavior even when the most extreme excursions occur. It also has a vented reinforcement collar that helps to enhance stability and rigidity of the cone/spider/voice junction. Additionally, it offers an improved thermal performance by directing airflow over the voice coil windings. Its bass is not punchy enough. If you need a whole-hearted bass in your car, buy the Kenwood KFC-800F. This 8” car subwoofer has a shallow mounting depth of 2-3/4” which gives you room for creativity. And the best part? It handles up to 600 watts of power even with this mounting depth. The subwoofer features a smooth liner rubber surround which protects the cone while also preventing it from getting displaced due to music flexes. Better yet, it has a superlinear spider for maximum control over the woofer’s linear motion. Kenwood KFC-800F also comes with a heat transfer system that helps to prevent the sub from overheating. You will also love its easy-to-remove gasket that helps to make it easy to tune the enclosure. The gasket is made of aluminum to make it much more durable and appealing. What makes Kenwood KFC-800F an even more impressive choice is its ample impedance of 4 ohms, outstanding frequency response of up to 500 Hz max, not mentioning peak power handling of 600 watts. Good quality sound for the money. Possibly needs a larger amp to produce more quality sound. When Kicker decided to make the Hideaway compact powered subwoofer, they wanted to make a sub that would fit everywhere and still deliver unmatched performance. This is exactly what makes the company so popular among car sound enthusiasts. At just 3” tall, the Hideaway will fit even under a seat where most subs can’t fit. The powerful sub features a strong bass with a built-in 150 watts RMS amplifier. The amp has an incredibly rich sound for any type of music. The Kicker Hideaway features an aluminum woofer cone with a Santoprene surround that ensures an enhanced bass response. Additionally, it has a built-in Class D amplifier which offers a brilliant audio. Better yet, it comes with a hook-and-loop as well as a quick-connect wiring which makes installation secure and smooth. The hugely popular 8 inch subwoofer has remote bass control for convenient and easy fine-tuning of the bass level. In addition, it has a quick disconnect 10-pin Molex harness that makes removal easy. Excellent bass- the sub offers that earth cracking bass you so much need. Fits perfectly- for storage, you can even fit it under your driver’s seat. It should have RCA for the price. If you’re looking for the best 8 inch subwoofer with an earth-shaking bass, then you need to try out the Rockford P3SD4-8 Shallow Mount Punch. This sub features peak power rating of 300 watts and has an RMS rating of 150 watts. It features an anodized aluminium voice coil former that allows dissipation of heat from the voice coil in a more efficient manner. Simply put, it plays a heat-sink role to dissipate thermal build-up the coil especially at high SPL conditions. The Rockford P3SD4-8 sub has been built to conform to the CEA-20131 power handling industry standards which help give you confidence that it has the capacity to handle the RMS rating. More importantly, it has a very low chance of fatigue or shorting since it has stitched tinsel leads to the spider. These stitching leads wires on many points of the subwoofer helps to reduce the mass of the tinsel leads thereby preventing stress on one point. Rockford Fosgate has also designed the woofer with the vertical Attach Surround Technique which helps to increase the surface area without causing installation issues. This improves the nominal efficiency as well as maximum output. Add some bumps to your trunk and enhance your car audio system with the Rockford P3SD4-8 Shallow Mount Punch 8 inch subwoofer. The Skar Audio ZVX-8 D2 is arguably the most complete SPL grade car subwoofer that Skar Audio has ever created. Specifically designed to be used as a competition car subwoofer, the ZVX-8 is among the audio head community which is not a surprise looking at it. It is equipped with a high-quality cooling system which controls the levels of temperature, especially when using its maximum power ratings. Better yet, it comes with a 2.5” high-temperature coil which even controls the temperatures even better. The 8 inch subwoofer features high roll long-lasting foam which keeps the cone centered and also yields a high excursion. In addition, it has a dual 2-ohm voice configuration for more enhanced effect. The Skar Audio ZVX-8 D2 is an absolute steal a reason it’s getting a lot of love from customers. The price to performance ratio is absolutely insane. The built is excellent but make sure you get its specific 8 inch subwoofer box to enjoy the best possible sound from it. Odd shape on the edges may make it a little difficult to fit properly. Unlike other car subwoofers that end up looking like someone curved them out of rocks and did a bad paint job, the Meso 8 inch subwoofer stands out with an elegant design. What’s more? It features a double-stitched paper cone that not only gives you a big bang but is also capable of producing ultra-low sounds without compromising on the quality of the audio. For a smoother excursion, the Meso 8 car subwoofer comes with a composite foam that ensures seamless music that’s devoid of those screeching sounds that you’ll often hear coming out of most woofers out there. While the price might be on the lower end, this speaker packs a Y35 graded ferrite magnet which is actually of one of the best worldwide. This powerful magnet will provide that much-needed quality beat. Comes with strong arms that firmly attach to the basket frame. This helps to minimize speaker movements thereby ensuring that no harm is done to it. 1600W max power capacity will be more than enough to provide the much-needed boom. When it comes to picking the best 8-inch subwoofer for your car, a few factors come into play including size, power consumption, and of course the quality of audio. The Skar-Audio-VVX-8v3-D4-Subwoofer offers all these functions quite effortlessly. The woofer features a high-grade paper cone with rubber butyl surround to ensure production of superb quality audio. The materials used in creating it are also long-lasting which means you’ll hardly need to think about replacing your music system anytime soon. Need to create that big boom? Well, this is the speaker for you; it has a max output of 800wats and an RMS of 400wats ensuring quality sound all throughout while still providing a loud output. High temperatures should not pose a big problem to the Skar as the woofer features a 2-inch high-temperature copper coil. One of the best sound quality and bang for your money. A durable cone that also produces super quality sound. Excellent temperature control mechanisms to ensure you never have to stop playing due to issues of overheating. Some users have complained of sound distortion after using the sub woofer for some time. Don’t have enough space in your car for that huge subwoofer you just saw at the electronics? Worry no more. The Rockford under seat subwoofer solves all this by combining an inbuilt 150W amplifier with an 8 inch subwoofer system. The result? A self-reliant bass booster that will leave you wondering where this combo has been all your life. What’s more? This car subwoofer woofer packs an adjustable 12db/Octave low pass crossover that is used to protect the drivers by separating the audio input to mid-wave and low sound wave outputs. Perhaps what you love even more about the relatively shallow Rockford Fosgate PS-8 is that it’s not only capable of giving you a commendable huge bass but is also powerful enough to do this without causing any quirks to the audio. The subwoofer features a closed-loop design that ensures optimal performance between it and the inbuilt amplifier. This is key in its provision of quality audio while also ensuring your system lasts longer. Great value for your money as it includes both an amplifier and a subwoofer. What comes to your mind when you hear about car subwoofers? Most people think about devices that produce tooth-rattling, bone-shaking bass. While this can be seen to be a fair correlation, there’s more than just the shaking sound in your car. No matter the kind of music you like, a quality sub can improve your whole listening experience. This is why it’s often said that the subwoofer you choose makes the difference between a good sounding and a great sounding system. The size of the subwoofer you choose to go for depends primarily on the amount of space in your car. In some cases, however, your car could be spacious enough to accommodate a bigger subwoofer yet your priority lies in maximizing your cargo space. In these two cases, you might want to consider a smaller but quality sub to serve the purpose. This is where an 8” car subwoofer comes in. Before buying a subwoofer, therefore, it’s advisable that you accurately measure the space in which you wish to place your subwoofer. This will make it easier to select the right size of the subwoofer for your vehicle. Do you know that the type of enclosure a sub is mounted can have such a huge effect on the quality of sound it produces? 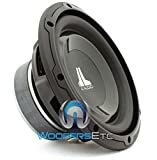 Well, we check the two main types of enclosures you can purchase for your 8 inch car subwoofer; sealed and ported. A sealed enclosure will offer an airtight space for your subwoofer which in turn gives a tight, natural-thumping bass. These sealed boxes have a flat or linear bass response which results in a pretty tight bass. They work well for fans of classical or jazz music since the resulting Cerro or the low keys of a piano sound so clean and natural. If you’ve seen a subwoofer featuring vents at the bottom side of the box, then you possibly already know a bit of ported enclosures. This vent allows air to move in and out of the box which results in a forceful, resonant bass. Ported enclosures are best suited for car enthusiasts that want to have lots of low-frequency output. As such, they are popular among fans of rocks, electronic dance, rap, and hip-hop who crave for that chest-punch bass. Bandpass enclosures might not be very popular which is why we didn’t mention about them earlier on. They are quite similar to the ported enclosures and will thus typically produce bass that isn’t too deep nor very loud..
Subwoofers require a lot of power to generate sound waves; only an external amplifier can provide the power. Therefore, when choosing an amp to power your sub, you’ll want to consider two main specs; the subs upper RMS and the Amp’s RMS output. The more power a woofer can support, the better. In fact, by underpowering your subwoofer, you may cause damage to it much easier than you would by overpowering it. A subwoofer with a higher sensitivity rating requires less power to create the same volume as that with lower sensitivity. It’s recommended that if you have a low power amplifier, you should get a subwoofer with a high sensitivity rating. Yes, you’ll come across subwoofers of all shapes including circular ones, triangular, pentagon, and rectangular car subwoofers. As much as all these are a good variation for style, the circular ones are said to be the best when it comes to the quality of the sound. On the other hand, rectangular ones allow more air to flow due to a higher surface area and may thus not be very effective in producing high-quality sound. Your budget is, of course, one of those key factors that come into play when purchasing any equipment for your car’s audio system. As you possibly know by now, a subwoofer can be a crucial component of your car. If you get a cheap one, there’s a higher chance that you’ll end up with a low-quality sub. To avoid this, try to compare a few subs based on their features and only go for the best one once you’re convinced about its features and its availability at a fair price. 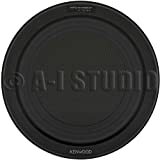 Our best 8 inch subwoofer reviews section is a valuable resource to check out for this. This will let you know how low the sound output of the sub can go. However, the enclosure type you choose for your subwoofer can help adjust the sound you get in such a case. A majority of car owners often prefer dual voice coils as they offer more flexibility in the wiring. You should ensure that the impedance of the subwoofer and that of the amplifier matches if you’re to get high-quality sound. When choosing the best 8 inch subwoofer for your car, make sure that you don’t compromise quality for a cheap alternative. It’s our hope that the above guide will help you acquire the ideal subwoofer that best fits your car.